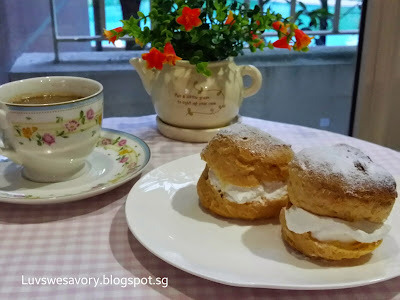 Sometimes I wonder what is the difference between Cream Puff and Profiterole as they are hollow rounds of choux pastry with sweet fillings and looked almost “identical”. Sweet Profiteroles (here) (pronounced pruh-FIHT-uh-rohl) are small, crisp, hollow rounds of choux pastry that are split in half and filled with sweet whipped cream, ice cream, or pastry cream. The classic version arranges the profiteroles in a pyramid shape with warm chocolate sauce poured over the top. So, am I still confused ? ! ... hee ... hee..
Sift all the dry ingredients in a bowl: flour, sugar and salt. Whisk together. Place the butter and water in a heavy saucepan over medium high heat and bring to a boil. (Make sure that the butter melts before the water boils to reduce the amount of evaporation.) Remove from heat. Stir with a wooden spoon and add all the flour mixture and stir until combined. Transfer the dough to your electric mixer, or use a hand mixer, and beat on low speed to release the steam from the dough (about a minute). Once the dough is lukewarm, start adding the lightly beaten eggs (dough will separate and then come together) and continue to mix until you have a smooth thick paste (dough will fall from a spoon in a thick ribbon). Spoon or pipe 12 small mounds of dough onto the baking sheet, spacing about 2 inches (5 cm) apart. With a pastry brush, gently brush the tops of the dough with a lightly beaten egg. Bake for 15 minutes 400 degrees F (200 degrees C) and then reduce the oven temperature to 350 degrees F (180 degrees C). Continue to bake for a further 30 to 35 minutes or until the shells are a nice amber color and when split, are almost dry inside. Turn the oven off, poke a couple of holes in each puff and, with the oven door slightly ajar, let the shells completely cool (and dry out). I used a toothpick to poke a few holes in each puff. In a large mixing bowl place the whipping cream, vanilla extract, and sugar and stir to combine. Cover and chill the bowl and place in the refrigerator for at least 15 minutes. When chilled, whip the cream just until stiff peaks form. I usually freeze the cleaned mixing bowl for about 10 minutes. Take it out from the freezer, immediately put all together the cold whip cream and caster sugar in the cold mixing bowl. Use the electronic mixer to whisk till stiff peaks form. Yes ! the crust is crisp and the insides is completely dry. 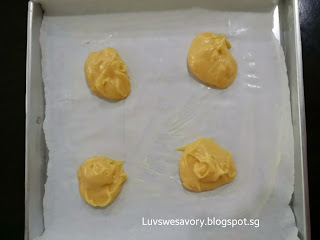 Hee .. hee .. can't wait to "slap" them with some whipped cream ... sorry I'm too 'kan cheong' (excited) ... I can't wait to fill them with the cold whipped cream. 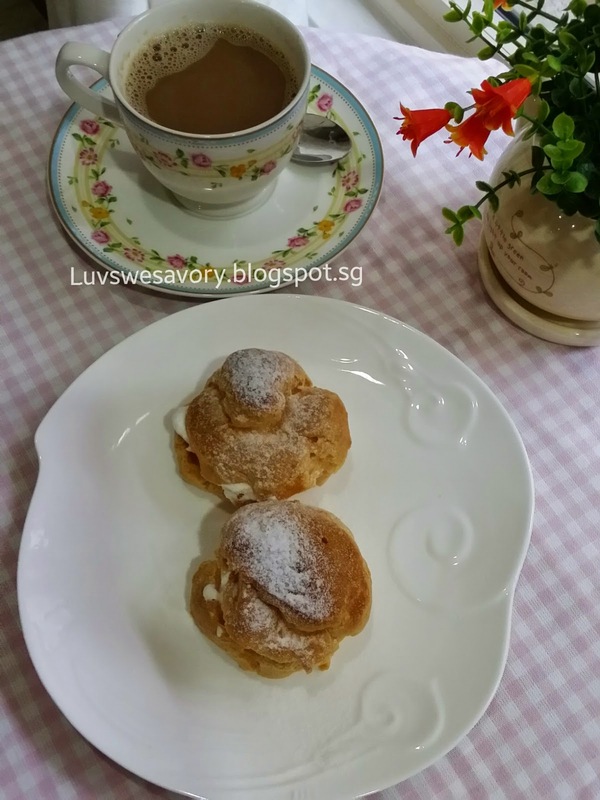 I think cream puffs and profiteroles are same same no difference! I am planning to make cream puffs today also and you beat me to it, I can't wait to bake mine! Hee hee ... ya same same! 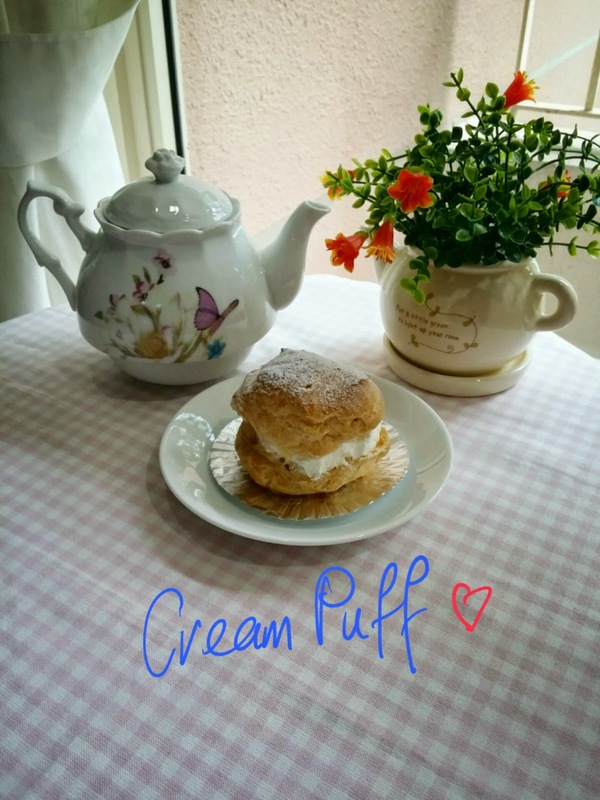 Looking forward to your sharing of cream puff ^-^! 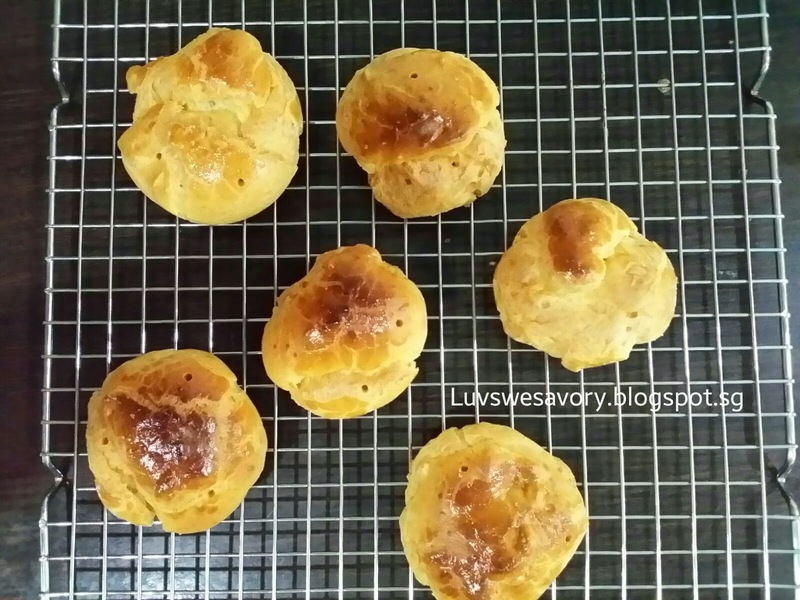 Your cream puffs turns out so perfect! Yum! Yum! My kids love to eat cream puffs and lazy me will buy them from the bakery! kakaka! 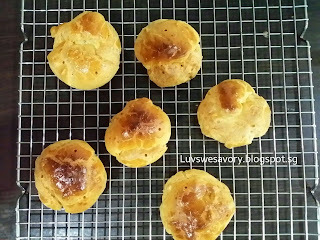 I never thought choux puff and profiteroles have any different...haha i thought they are the same. These look fabulous! It has been ages since I last made cream puffs, but I do recall them being a lot easier than I thought they would. Congrats on such a beautiful job. Hello Pattie, thank you for your compliment and thanks for dropping by ^-^! ooooh...yummy yummy...i can imagine myself popping them... I would always loved to buy the Japanese cream puffs that loaded with lotsa fresh cream! !